BIO-CALCIUM-Cal Toddy is the logical choice of seniors, athletes and any one else concerned about getting enough calcium. BIO-CALCIUM-Cal Toddy 32oz Item #: 81200 Now in liquid form. What Makes Cal Toddy- BIO-CALCIUM Different? Cal Toddy has been specially formulated to provide the body with the minerals magnesium, manganese, zinc, boron and copper which have been known to improve the uptake of calcium by the bone. 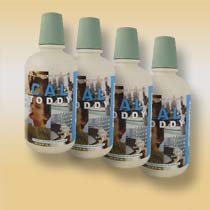 Since calcium is one of the most difficult minerals to absorb, Cal Toddy's new liquid form significantly increases the absorption of calcium by the body. Calcium is an important nutrient for the body in the development and maintenance of healthy bones. According to government figures, the average calcium intake of most American adults, both men and women, fails to meet standards for healthy bones set by the National Institutes of Health. In fact, on average, women over age 50 get less than half the calcium they need! Calcium supplementation is also especially important for athletes. The majority (99 percent) of the body's calcium is found in the skeletal system. However, a very small amount (1 percent) circulates in the bloodstream where it is vital to internal biochemistry. When calcium intake is less than optimal the body's equilibrium mechanisms will pull calcium from the bones to maintain adequate calcium in the blood - thus furthering chances of osteoporosis. Research proves calcium supplements can decrease the risk of bone loss and fractures due to osteoporosis. Studies show that supplemental calcium should be chelated and combined with synergistic nutrients to ensure absorption. In addition to calcium, other minerals and nutrients promote assimilation of calcium. Certain nutrients which enhance the absorption and retention of calcium are: potassium, magnesium, zinc, manganese, copper and boron. These nutrients assist in the assimilation of calcium so it can work to help stop bone loss and improve electrolyte balance. One ounce daily or as advised by your Health Care Practitioner. What is the use of MAGNESIUM ? No single formula can meet the exact nutritional needs of every person who takes it.